The three novels which make up The Forsyte Saga chronicle the ebbing social power of the commercial upper-middle class Forsyte family between 1886 and 1920. This, the only critical edition of Galsworthy's popular masterpiece, contains detailed notes which are vital to the saga, explaining particularly the contemporary artistic and literary allusions, and slang of the time. Although I dove into this hefty novel thinking it would be not much more than frothy Victorian scandal and romance, I was pleasantly surprised. Don't get me wrong--the scandal and romance is there, but it did have a bit more to offer than all that. Galsworthy manages to comment on the Victorian British middle class (upper-middle class?) in a way that's still interesting to look in on. Also, the character Irene is expertly handled; we never hear her thoughts and feelings as we do all the other characters, yet she's more or less the center of the story. All the other characters (especially the male ones) revolve around this one person who the reader must size up without the benefit of being told her side of things. I would call the book very well written, if not a little over-the-top or dramatic at moments in terms of sentiment, although this is as much as I expected. John Galsworthy's Forsyte Saga is made up of 3 novels and 2 short "interludes." The works concern themselves with the family dramas of the Forsyte clan, who we meet in the late 1800s in London. They are upper-class, but recently so, still feeling the sting of having a not-distant-enough ancestor who was a farmer. Galsworthy frequently reminds the reader that the Forsytes are a type, not just an individual family. New money, and those most concerned about acquiring and keeping wealth and property are called "Forsytes," no matter what their name may be. Personally, I think the books would have benefited from less emphasis on that point, but I suppose it seemed like a good idea to have these reminders that the Forsytes were not alone in their attitudes and foibles. The family stories are engaging, and each of the many Forsytes have their own distinct personalities, even as they're shaped by the times in which they live. The oldest generation ranges from the reclusive Timothy to the softened-by-age Old Jolyon, to the crotchety James. The middle generation is much different from their elders, both as a reflection of the change in attitudes brought about by the turn of the 20th century and as a reaction to their parents' values. Much of the substance of the series turns on members of the second generation - Soames, his wife Irene, and Young Jolyon in particular. But they also have their turn as the older generation as their children come of age and have ideas of their own about what's important in life. However, one can never really escape the past; some actions have effects that reverberate through the generations, however much one tries to ignore them and move on. Although a long read, it was enjoyable and not difficult to follow at all. The family themes of love, duty, forgiveness, second chances, and propriety are set against the backdrop of changing times - not only the turn of the century, but the first World War, the Boer War, and the change of lifestyle brought on by the popularity of automobiles. Recommended for: people who liked Pillars of the Earth or Edith Wharton's Age of Innocence, people who like to watch miniseries, Anglophiles. Quote: "The persistence of the past is one of those tragi-comic blessings which each new age denies, coming cocksure on to the stage to mouth its claim to a perfect novelty." I really enjoyed this novel. It has a very rich writing style. Rich in the use of language. Rich in the variety of characters and personalities and their interaction. Rich in the plot itself. The novel traces the lives and travails of three generations of an English family residing in London at the end of the 19th century through the first couple of decades in the 2oth. It's a story of a wealthy family embedded in the Victorian tradition that sees the transition to modernism among the younger generation. It has a vast number of characters, all family relations which makes it difficult, at the beginning, to keep track of who is who and who is related to whom. My copy has a very handy family tree that helped identify the characters and their relatioins. Galsworthy does a great job in depicting the peronalities and emotions of the novel's characters. And they cover the whole range. Some of them are clearly dumb while other are very intelligent. Family and social tradition plays a key role for many of the characters, particularly the older generation. The younger generations, as it always the case, rebel and do not value those traditions necessarily, with dire results for the family. I thoroughly enjoyed John Galsworthy's "The Forsyte Chronicles." Best described as a Victorian soap opera, the book (which actually contains three novels and two short stories) follows several generations of the Forsyte family. Money, power, love and death are at the center of the story, as is the changing landscape of London during the Victorian era. 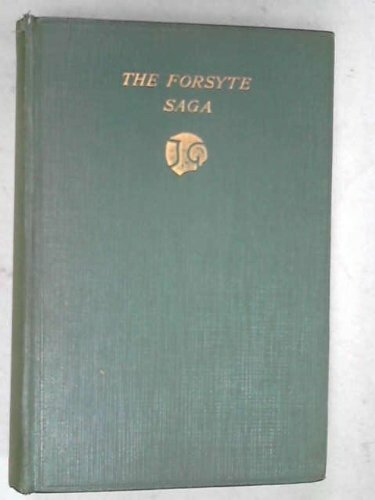 This version of The Forsyte Saga by John Galsworthy is over 800 pages and consists of 3 books; A Man of Property, In Chancery and To Let as well as 2 short interludes; Indian Summer and Awakening. This is a family saga about money, morals and class at the beginning of the 20th century. The Forsytes are an upper-middle class family that have good expectations of improving their status. While the main focus of the story is on the disintegration of the marriage between Soames Forsyte and his wife, Irene, and the interactions between these two and their families, there are other plots involving this multi-generational family that revolve around the expansion of their wealth and the price paid for this obtainment. I have to admit that by the third book I was quite tired of reading about Soames and Irene as well as their overdone “soap opera” plot. While Soames’ journey through life was difficult, I didn’t feel much sympathy for him as I found him quite pompous and rigid. At the same time, I found his wife, Irene too cold and distant to ever feel that I knew her so I couldn’t generate much interest in her story either. In the later books, I did like both Fleur and Jon, but it was easy to see what was going to happen with this relationship so I was never emotionally invested in their story. One of the best books I ever read. It is very well written. It also is very, very English. The story has no flaws at all. Read this! John Galsworthy was born on August 14, 1867 in Surrey, England. Although more popular as a playwright during his lifetime, Galsworthy is now famous for his fiction masterpiece, The Forsyte Saga, which won him a Nobel prize for literature a year before his death in 1933. The saga traces the ups and downs of the upper middle class Forsyte family from the end of the 19th century up until 1920 in a series of three novels and two “interludes”. Think Downton Abbey. Did Nature permit a Forsyte not to make a slave of what he adored? Could beauty be confided to him? Unlike Downton Abbey writer Julian Fellowes, John Galsworthy dissected the lives of the people of his own class. Galsworthy could not tolerate the obsession of his peers with buying and selling. The idea that one could “own” ineffables such as beauty and love, whether as art or a wife, was contemptible to him. He channelled his disgust into the creation of the odious but unforgettable Soames Forsyte, jealous husband of the beautiful Irene (pronounced in the Edwardian style: I-REE-nee). Galsworthy was clearly in love with the character of Irene, making her story of self-determination the unifying thread of the entire tapestry. Indeed it is hard to miss his empathy for women in this series. About 40 years after watching the 1960s British television production, I finally have read this trilogy. I didn’t even remember the plot(s) properly. And I would never pretend to appreciate in depth the literary aspects. But the writing is a delight, the characters complex and fascinating. Just outstanding. The Forsyte Saga is the epic story that revolves around three generations of the Forsyte family, who have gone from being middle class tradesmen to a wealthy and powerful family. Although very fun for it's depiction of England and London society from the end of the Victorian period through the Edwardian era, the series is a great story about passion, love, jealousy and the interplay between members of a family. The book is actually broken down into 3 novels with 2 short stories in between. Although I enjoyed the first story, 'A Man of Property', I wasn't completely hooked until the second story. Part of the difficulty is the enormous cast of characters. Although I wasn't sure who was who in the first story, by the end of the book, I knew all of their relationships and odd personality quirks. Definitely worth rereading just to enjoy the entire book. Drat. I see I lost the slip of paper where I write page numbers and the little notes for the book report. There are a few numbers scrawled on the inside back cover; page 785 has cricket, 808 the fixed idea, and there's a giant dog-ear folded from the bottom of the page. That would be a chapter I want to read again. I put off finishing it too. The book was left untouched at page 830 for an entire month. Didn't want to finish it. I had been through too much with them, especially the unloveable Soames, and the houses; Robin Hill and Timothy's. "His heart made a faint demonstration within him while he stood in full south sunlight on the newly whitened doorstep of that little house where four Forsytes had once lived, and now but one dwelt on like a winter fly; the house into which Soames had come and out of which he had gone times without number, divested of, or burdened with, fardels of family gossip; the house of the 'old people' of another century, another age." A social satire starring the Forsyte family. Excellent writing but a little hard to follow sometimes because of the number of characters and situations. Classic novel of the emerging British middle class during the Victorian era. It examines the role of women, money, and obsession during Britain's empire era. Young readers from nowadays will not have the time to consume the whole series of several novels. The first interlude “Indian Summer for a Forsythe” may be a good selection to receive an impression about Galsworthy’s clear style and his subtlety.